Today I threw the college guides into the recycling bin. What a relief. They’ve been on the family room coffee table for 5+years, sometimes sitting on the top, sometimes buried underneath on the bottom shelf among the various other magazines and books that find their way there. If you’re a frequent reader of My Left Breast, you’ve probably realized by now that I love to research. Everything. Obsessively. 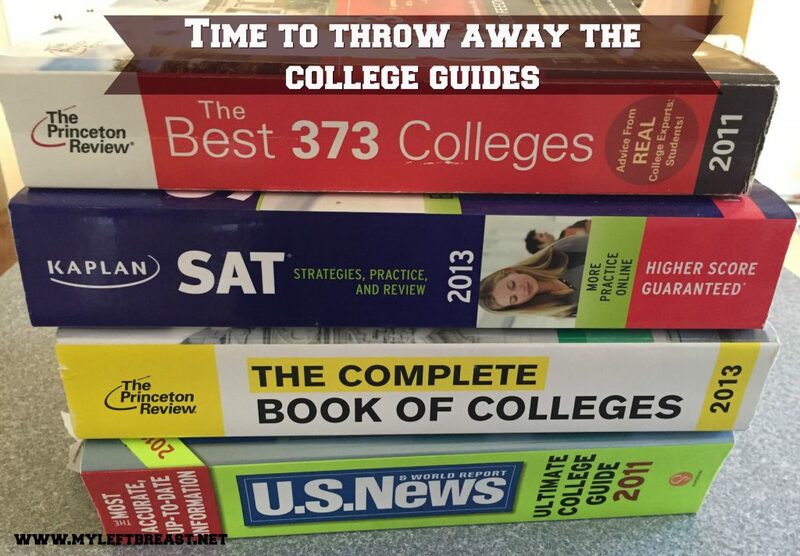 So, back in 2011, when my daughter was a Sophomore in high school, I went out and bought every single college guide I could get my hands on: The Princeton Review Best 373 Colleges, US News & World Report Ultimate College Guide, The Complete Book of Colleges, Fiske’s Guide, the Kaplan SAT Guide. You name it, whatever book I could find that would help us navigate the maze of how to figure out what would be the best college for my daughter and son, I bought it. Each guide is well worn by now, with folded corners to bookmark the pages of those colleges that I thought would be the best ones, based on my various criteria of what constituted a good college. I obsessed over them and made lists and notes in each book. I rated them by dozens of standards: academics, cost, location, region of country, diversity, size, proximity to cities, food choices, student reviews, classroom size, student/faculty ratio; you get the picture. I put little color coded sticky notes on the pages of the schools I thought would be best for my daughter (and 2 years later, my son); marked the pages of every school I thought might be “the one.” I’ve been doing this for the last 5 years. Books comfort me. 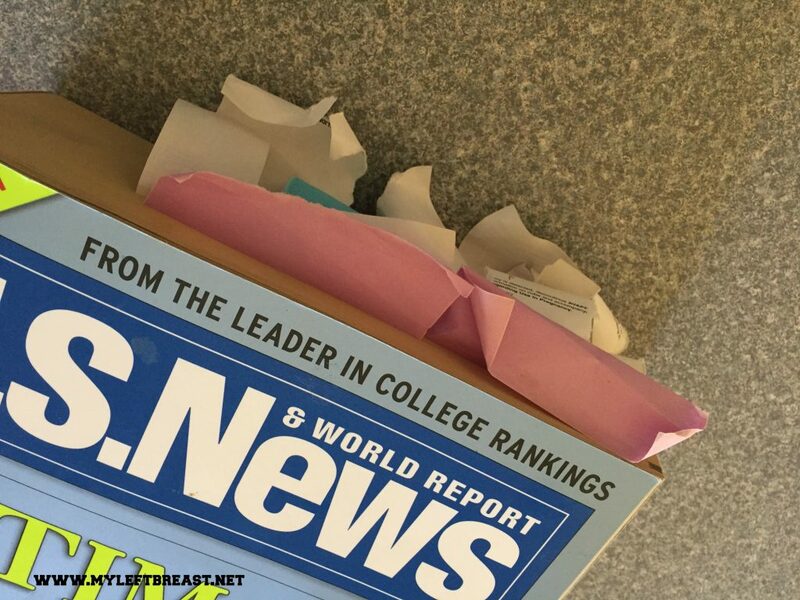 The complexity of the college search process scared me, filled me with anxiety and dread. Anxiety that we’d make the “wrong” choice, dread that my children were growing up so quickly and going to be leaving and going off to a new world without me. So I read these huge guides over and over, hoping for reassurance by holding on to what was familiar to me — research and reading. The two things that have helped me in all aspects of my life, including my breast cancer experience. For me, when in doubt, research and read. The obvious disconnect is that I’m the only one who has been reading these books. My daughter spent a little time in the first year, reading and making notes on one of the guides but after that first year, she basically ignored them and spent all of her time researching schools online. My son has never, to my knowledge, even cracked open one of these myriad guides I have obsessed over. What I failed to realize, of course, is that the choice had very little to do with what I thought was the right school for my daughter and son. They, of course, had to make the ultimate choice. They’re the ones who are going to live in these new worlds for 4 years, and must commit to the level of work, the culture, the people, the location and ambience; it has nothing to do with me. When my daughter was a little girl, we watched the the movie “Freaky Friday” together. I always so identified with the mom (Jamie Lee Curtis) who would cheerfully say “Make good choices!” as she optimistically dropped her kids off at school each morning. I adopted the phrase and used to shout it out to my kids every morning when I’d drop them off at grammar school, always greeted with eye rolls from the two of them. But something must have sunk in because with very little input from me, both of my kids have made remarkably good college choices. I’m so relieved to be able to throw those damn books away. So funny! My den is also cluttered with these books. I’m getting ready to toss them also. My baby is heading off to college in the fall. He barely looked at them as well. My husband and I fell prey to the endless lists, tips and madness! Oh, Claudia, this made me laugh! Especially that last line. I do the same thing I buy books when I need to lessen my anxiety! Our kids love their internet just like we love those books! Times have changed. Hi Rena!Nice to know I’m not the only one 🙂 My family room table is so roomy now without all the guides, they were so big and took up so much room! I love to get rid of clutter and throw things out…. Even if they didn’t crack the spine you did and could base your recommendations or not on your research. Really, right! Made me laugh because I am with you, I want to research and why won’t anyone listen to my comprehensive analysis ??? So what colleges did they choose? Glad both your children are happy with their college choices. Your post reminded me of what my son said about my daily NY Times newspaper habit. He doesn’t understand why I like to get my hands dirty with news print when I can read it online. I’m old fashioned – I like holding the paper. What a great feeling, right? I remember that time. But did my kids look at those books? Not nearly as much as I did!! My daughter did a few times, but I don’t actually think my son ever looked at a single guide!